It must be something in the water. How else to explain the convergence of natural beauty, gourmet food and wine, award-winning arts and lovely settings that make Southern Oregon such a draw? Pioneers settled the area in the mid-1800s as a prime agricultural region conveniently located between more populous areas to the north and south. Over a century later, you still can’t miss the orchards, the small main streets and the mineral-rich (and, a warning, not very tasty!) water bubbling through Lithia Park’s fountain in downtown Ashland. You also can’t miss the abundance of wedding riches spread all throughout the Rogue and Applegate Valleys. 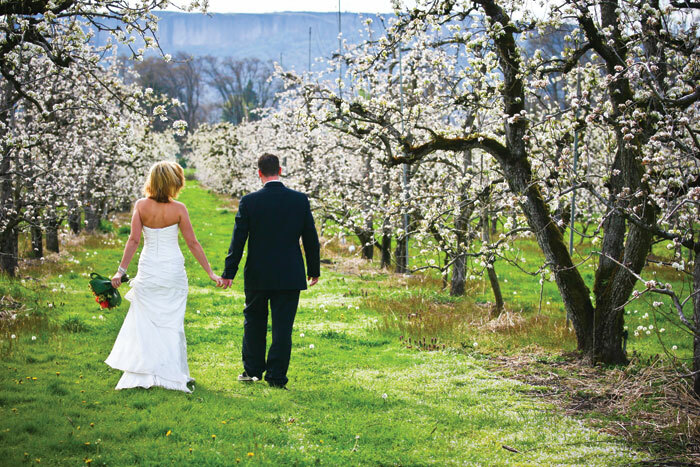 This gateway to the Northwest—from Ashland just 15 miles past the California border and neighboring Medford, to Roseburg north and Grants Pass to the east—offers a wide variety of unique venues, whether you’re looking for an elegant estate or a rustic ranch. Moderate year-round weather makes planning outdoor events ideal; in fact, many indoor options feature lush garden settings that invite guests outside. And thanks to the renowned Oregon Shakespeare Festival putting Ashland on the map, you’ll find world-class vendors without sacrificing the smalltown charm. Inspired by Southern Oregon’s flora and fauna, the charming Ashland Springs Hotel sprinkles botanical and natural curiosities throughout the venue, from the towering palms in the lobby to the classic English outdoor garden where most couples choose to take their vows. “Mother Nature does everything for you in Ashland,” says sales and catering manager Gina DuQuenne, referring to the verdant rolling hills that surround the town. But even Mother Nature needs help planning a wedding. Enter the Springs’ expert staff of wedding professionals (DuQueene was even featured on television’s Platinum Weddings) for a carefree day that comes together, well, naturally. Hidden down a poplar-lined drive in the sleepy of town of Central Point, The Willows’ 100-year-old house, situated amongst its cultivated grounds, is the picture of elegance most people associate with the playgrounds of the rich and famous. “It’s more of a place you would find in Napa,” says owner Sandy Dowling of the sophisticated vibe. As in Napa’s famous wine country, The Willows’ gorgeous environs compete with food and drink for center stage. Expect exquisite food from local vendors such as Rogue Creamery and neighboring wineries, served from the B&B’s carriage house kitchen, where Dowling also runs her cooking school. A romantic flowing water fountain, grape arbors, carefully manicured gardens along the banks of the South Umpqua River above Roseberg—Melrose Vineyard’s cup overflows with dreamy details. Choose between their outdoor meadow or indoor tasting room, both of which include on-site catering and of course, wine. Unlike many vineyards where amenities are limited, Melrose makes dressing rooms and lounges available for behind-the-scenes primping and last minute touch-ups. Taking its name from the winding river that can be seen from the deck of every guestroom, the Applegate River Lodge is as laid-back as its namesake. “People always arrive and comment on how good the energy is here,” says owner Joanna Davis. Weddings at the Lodge can be as elegant or casual as the couple wishes. If trashing that wedding dress is on the agenda, the entire wedding party can take a swim in the river after the ceremony. For a truly unique and intimate venue, The Chateau, situated in the Oregon Caves National Monument deep in the Siskiyou National Forest, hosts small weddings from May until October each year. A marvel of 1930s architecture and engineering, the Chateau retains its rustic charms as it straddles a woodland stream against a steep drop-off from the road. A stone fireplace dominates the lobby where most ceremonies are held; don’t miss a photo opportunity at the Chateau Café, a 1930s-style diner perfect for a vintage vibe. A visit to Jacksonville, the historic mining town five miles west of Medford, is a glimpse into Oregon’s pioneer past. Jacksonville’s downtown is full of buildings dating to the 1800s (and a few painstakingly re-created ones) when gold ran through the town’s creeks. Just beyond the historic district, the Victorian-era Jeremiah Nunan House presides over lush outdoor grounds with sheltering oaks. Weddings inside the house benefit from the period furnishings and romantic setting, while nature takes care of the decoration outdoors. Nestled among blue-green hills of pear orchards, Eden Valley Orchard (and its adjoining winery, EdenVale Winery) south of Medford is steeped in Southern Oregon’s agricultural history. Indeed, they encourage couples to utilize the bucolic setting for their celebration, like getting married in the thick of the vines. Being amongst such beauty, it’s reassuring to know that unlike many early-closing venues, Eden Valley allows receptions to continue into the wee hours of the morning. Over the top. That’s how Andy Calvert of The Perfect Occasion describes his design aesthetic. “I want to make every wedding unique,” he says. “The crazier the brides’ ideas, the better.” The Canyonville-based Calvert has been bucking traditions (he hates them) since his first wedding-planning gig ten years ago while still in high school. “I want the bride to be pleasantly surprised,” says Calvert of his penchant for show-stopping details like hundreds of colorful lanterns hanging from tents or the groom flanked by groomsmen dressed as Depression-era gangsters. One thing’s for sure: His weddings are never boring! “You name it. If the bride wants it, I will make it happen,” says Nicole Garcia of Jane Productions. From couture elements like custom monograms, paintings and ceremony canopies to incorporating dramatic peacock feathers and purple orchids into the design, the ladies of Jane never shy away from a challenge. Garcia and her partner, Jen Burke, strive for a seamless event by taking care of everything from floral design to the actual ceremony with equal passion. After closing Petals & Ink’s retail store in Talent last year, owner Suzy Stone now offers private consultations in her cozy Ashland studio. “Your invitation sets the stage for the whole wedding,” says Stone.“ It gives your guests a preview of what’s to come.” Working with design-savvy printers and designers such as Delphine, Stone’s selection includes high-end letterpressed invitation suites as well as less expensive options. Margo Moore is “all about my girls.” For 16 years, she has put brides first at her charming full-service bridal salon, sourcing a variety of the latest designs to fit every style, figure and budget. There will be no wrong orders or late deliveries here—Margo strives to make it right the first time, saving time and guaranteeing the dress will be ready-to-wear with plenty of time to spare. She’ll even teach your mom or maids to properly lace and fit the gown so you’re perfectly, effortlessly gorgeous on your wedding day. Occupying 3,750 square feet filled with anything and everything a bride could need for her wedding, from linens to lingerie, it’s hard to believe that Your Wedding Connection could also contain a standout selection of hard-to-find wedding dresses. Brides are invited to try on as many dresses as they’d like while working with the Connection’s experienced consultants. The best part? If a bride finds a gown she likes and it fits her, there’s no need to wait for a special order (de rigueur in most other shops)—the Connection will sell the dress off the rack. After growing up with a florist father and owning his own shop for the past 25 years, Rick Samuelson has seen quite a few changes in the wedding flower business. “Many brides come in with a fair idea of what they want. That’s a big change,” says Samuelson, who owns and operates Judy’s Flowers and Gifts with his wife, Judy. While they can order anything you want, including exotic and organic varieties, one thing’s for sure: Timeless flower designs and personal service never go out of style. Things are curiouser and curiouser at this fanciful Main Street flower shop, whereallusions to Alice in Wonderland abound. “Our flower shop prides itself on being trendy and cutting edge,” says owner Leslie Kirkland, who uses only sustainably grown or organic flowers in her naturalistic designs, incorporating unexpected elements such as fruit, moss or rare flower varieties. Brides will appreciate the care and attention given to every bouquet—and every budget. It’s hard to resist the cheer infused in everything chef Awna Zegzdryn touches: daisies seem brighter, food tastier, smiles bigger. “The couple that hires us is looking for something unique and delicious,” says Zegzdryn, who listens to her client’s culinary desires. “Every party is different—the menu should be as well. An old family recipe? No problem!” By utilizing fresh local produce and ingredients, AZ can guarantee your Aunt Betty’s meatballs never tasted so good. As a chef at Mar-A-Lago, Donald Trump’s private estate, Dave Kruger was on his way to cook breakfast for his boss three years ago when he was injured in a car accident. Too bad for “The Donald,” but a boon for the Rogue Valley, where Chef Dave returned to recuperate and ultimately revive Cuisine de Jour, which he first started on the East Coast. Now outfitted with Southern Oregon’s only mobile kitchen, Chef Dave and his toque-headed staff serve up the finest dining in even the most remote wedding locales. Every menu is unique to the couple, a perk even The Donald could appreciate. What would a rustic wedding be without yummy BBQ? Owner Trevor Wittmers learned the art of Southern cooking while living in Nashville and brought back the secrets, including a recipe for his own special sauce. Family-owned and operated, Rogue also prides itself on its Southern hospitality; full table service is available or guests can eat the dripping BBQ with their hands—plenty of wet naps provided, of course! Wedding cakes beg to be eaten, yet how many times has a cake’s taste lived up to its towering frosted decoration? Instead of over-baking its creations to create stability, Apple Cellar Bakery uses some creative construction to keep its popular vanilla sponge cake (with pastry cream and fresh blackberries) moist and delicious, even while piled high on tiers and covered in vanilla cream and flowers. With over 20 years of experience getting Grandma—and the rest of the wedding party—on the dance floor, Jes Webb’s Sights and Sounds Unlimited is Southern Oregon’s one-stop party shop. In addition to dance floors, disco balls and DJs, their rental supplies include memorable show-stoppers such as fog machines and photo booths. Unexpected and daring, photographer JoHanna Evins will literally stand in traffic to get the best shot. For a recent wedding portrait, she plopped the happy couple on a vintage 1920s couch in the center of Ashland’s Main Street for a truly unique image of love under the stars. Her photojournalistic style captures memorable moments that the wedding party may miss out on. As a former motorcycle sports photographer, Derek Steahly knows that the most important part of his job is getting the shot. “You have to be there the instant the action hits,” says Steahly, who finds the same is true for capturing the series of fleeting special moments that make up a wedding. “I always have to be on my toes.” Expect images full of movement and energy illustrating a wedding’s wild ride.